How does this compare to Atom, (which I've been loving)? Does this have multiple patterns? Or is it just one sequence per project? This is quite wonderful. With the timing, gating and repeat functions, as well as the arp settings, you can get into some really interesting and useful melodic/rhythmic territory. One thing - some of the controls are sort of hiding on the far right, so it’s not always easy to get to all of the functions. If this thing had a Probability/% Play and Randomize note within Scale parameter it would be the best thing ever Right now, it's pretty nice from a functionality stand point. Would sending notes to Cality work for this? +1 Those would increase my interest x2. There are such many new MIDI Apps, that I already lost control. Same. Dove into it again and it doesn’t do what I think you want. It does have a random function actually. In arpeggio settings, you can change the style up, down, up down, or random. But it does not have functionality for assigning random note values. Although, it has something way more fun, the "lock mode". You can assign random notes by yourself by swiping your finger around the faders randomly, you can literally draw a graph for sequencing in that mode. Also, if you try to change the master fader's mode to "shift mode", you can shift all faders up and down, while you are playing. And also, in AUv3, you can even hook up an LFO to the master fader and let it oscillate the master fader for you automatically since it is an audio unit parameter. Other than that, I'm not sure what you mean by the probability function. You mean like chance of that step getting played? Yep. Just looking to replicate some of the functionality of an Octatrack and OP-Z on iOS. If you allowed the user to specify %Play and Random Note Played per step on a slider (like you offer for Velocity, Gate, Modulation, etc) the user could specify if they wanted an assigned note per step to play from 0-100% of the time as it makes it way thru the sequence. The Random attribute would also, allow the note that the user specified on a particular step to be Randomized based on a percentage as well. So let's say that the user specifies a C4 on Step 6, and set the %Play to 50%, it would play that C4 note 50% of the time as the sequenced play. And if the user specified that Step 6 was randomized 10% of the time, that C4 note would be randomized Up/Down within the chosen scale 10% of the time when it was played. Also, if you try to change the master fader's mode to "shift mode", you can shift all faders up and down, while you are playing. And also, in AUv3, you can even hook up an LFO to the master fader and let it oscillate the master fader for you automatically since it is an audio unit parameter. @ALB The controls are not hiding you need to swipe left on them to reveal the master fader and ARP. @cem_olcay Would you consider adding a “ tie” option for notes ? Yeah, I’m even flashing the scroll bars a few times for making it clear that mode and settings area are scrollable horizontally, if you are out of space. Just grabbed it with the last bit of my apple gift cards I got for my bday! Had a great 75$ run with em, great way to finish em off! Does the arp always have to be running or can we do longer sustained notes? I was wondering if there was a reset mode and found this in the other thread.. If you double tap on a step's led in the pitch bend mode, you can reset it to the zero. In fact, in every mode other then note mode, if you double tap on a led, it resets that fader's value. Of course, in note mode, it opens to step editor if you double tap on the led. Just picked this and Cality up. We are being spoiled with apps this year!!!! Hi @cem_olcay A tie / slur option would stretch out the gate length of a individual step to the next step. If the next step pitch is the same as the step with slur applied it becomes a tie. 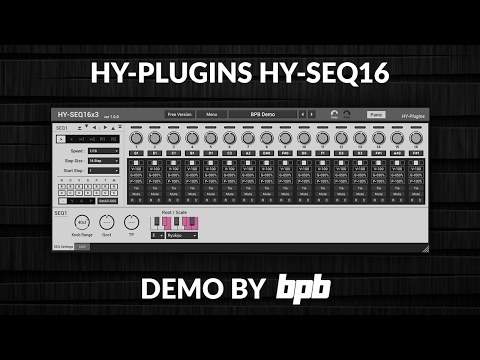 I use HY plugins on desktop a lot. HYSEQ 16 X 3 is a pretty neat step sequencer and one of my favourites. It has some of the same functionality in its basic form as StepBud. It also has step probability, Slur, aswell as many other features. It’s great to see you brought a little bit of it’s magic to StepBud and iOS. Here is a quick video showing version 1 of the plugin. It’s got a lot better in version 2 but you get the idea of probability etc. Yeah, will release an update today, I'm working on it. Modulation sends MIDI CC to the synth like a modulation wheel does. I really like this app @cem_olcay - great job. 1. Slider Values - When changing sliders it's often impossible to tell what you're setting the value to, as the value is only shown in the slider and it gets cut off. This is particularly a problem for chords and time values. One solution might be to show the value that's currently being changed somewhere else in the interface. 2. Slider Width - Could the slider's width expand to be the entire width of the screen. If I have 8 sliders, it seems a bit ridiculous to have them so small on the left of the screen where I can't see the values properly. Or maybe this could be configured. Not sure. 3. Setting slider values - It's often hard to set the value accurately. Something other apps do with sliders is when you move your finger away from the slider, horizontal movements become less precise so that larger movements result in smaller changes. This allows you to quickly move a slider and then dial it in precisely if needed. 4. Step Keyboard - I like this. What I would really like is the ability to set the notes/chords for a step using the keyboard, and then advance to the next/previous step. Currently I have to close the keyboard, select the next step, reopen the keyboard. Not a great workflow. And also a request for an enhancement. Would it be possible to have a mode where the step lengths are different. You can get really interesting polyrhythms by using (say) a 5 step melody against a 3 step rhythm. Or have a 5 step melody against a pattern of seven accents. I feel that if you implement this (please do, as it would be righteous), it should be an additional mode that the user selects. Again, love this app. I've wanted this workflow for a long time.